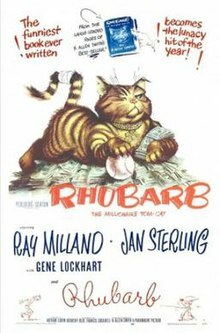 Rhubarb is a 1951 film adapted from the 1946 novel Rhubarb by humorist H. Allen Smith. Directed by Arthur Lubin, the screwball noir comedy stars the cat Orangey along with Jan Sterling and Ray Milland. Cinematography was by Lionel Lindon. Fourteen different cats portrayed Rhubarb at different points in the film. Each cat was trained to do a different trick. Three of the most similar looking cats appeared in the courtroom scene where Polly Sickles has to choose which one is the real Rhubarb. Thaddeus J. Banner (Gene Lockhart), a lonely, eccentric millionaire who owns a baseball team, the Brooklyn Loons, takes a liking to a dog-chasing stray cat (played by Orangey), and takes him into his home. He names the cat "Rhubarb," which is baseball slang for an on-field argument or fight. When the man dies, it is discovered that his last will and testament made Rhubarb his sole beneficiary; hence the cat inherits the baseball team. Team publicist Eric Yeager (Ray Milland) is named the cat's guardian. His fiancée Polly Sickles (Jan Sterling), daughter of the team's manager (William Frawley), is terribly allergic to Rhubarb, causing many problems. Banner's spoiled, greedy, and unhappy daughter Myra (Elsie Holmes) files a lawsuit, contesting the will. And when the team's players discover they are owned by a cat, they stage a protest until Yeager persuades them that Rhubarb brings them luck. Brooklyn begins winning and will play the powerful New York team for the championship. But a bookie who stands to lose big if Brooklyn wins decides to kidnap the cat. Brooklyn's fortunes turn for the worse while the search for Rhubarb goes on, until the cat finally escapes from his captors and races to the ballpark to save the day. The film earned an estimated $1.45 million at the US box office in 1951. Orangey won PATSY Awards (Picture Animal Top Star of the Year, the animal version of an Oscar) for his appearances in both Rhubarb and Breakfast at Tiffany's, the only cat so far to win more than once. Strother Martin and Leonard Nimoy have uncredited roles in this film. The film was released on DVD by Legend Films on July 1, 2008. This page was last edited on 2 October 2018, at 18:08 (UTC).